"To Love and Serve the Lord"
Welcome, St. Mark's Port Royal! 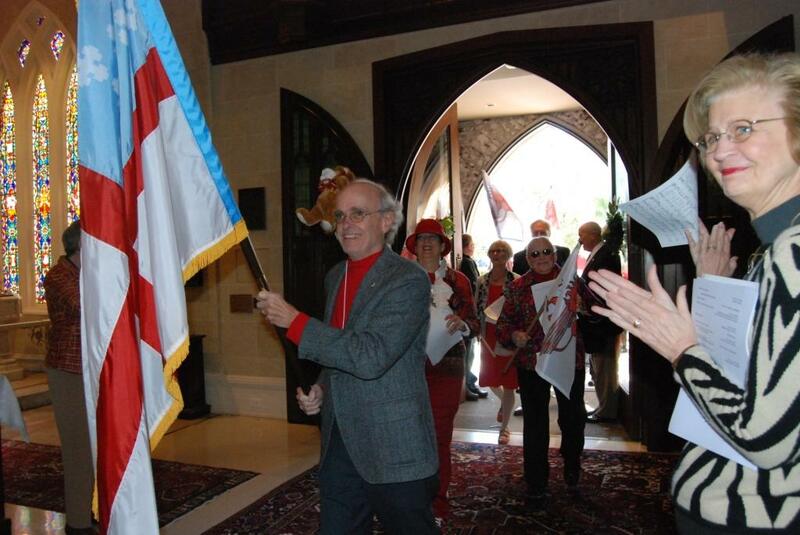 Bob Pinkerton carries the flag of The Episcopal Church into the Convention as the newest Mission of the Diocese enters Grace Church to a standing ovation on March 9. Click on the photo to see an album on our Facebook page. 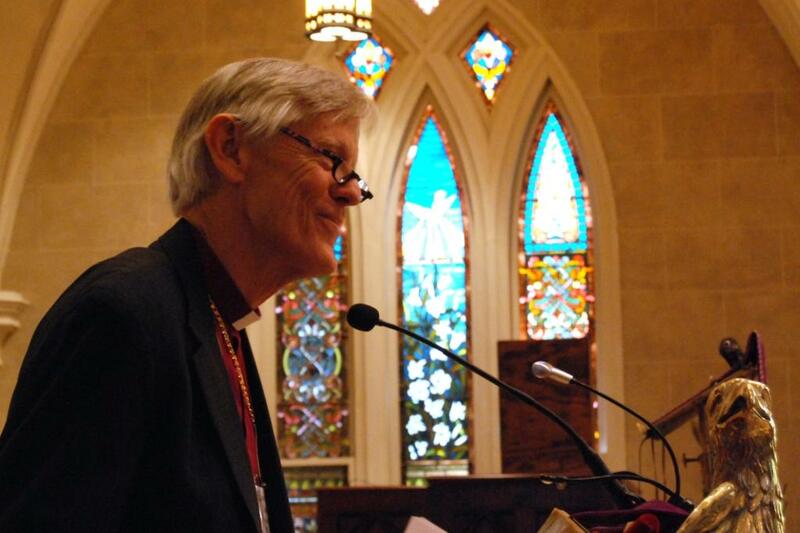 The Right Reverend Charles G. vonRosenberg, Bishop of The Episcopal Church in South Carolina, addressing the Annual Diocesan Convention at Grace Episcopal Church, Charleston on March 9, 2013. Video of the Bishop's address can be viewed here. Several weeks ago, I was honored to be asked to preach at the Absalom Jones feast day commemoration at Voorhees College. As I prepared for that sermon, I was struck again by the significant example and witness of Absalom Jones. Born a slave, he managed to educate himself and, later, to purchase his freedom and that of his wife. Eventually, he became the first African American priest in The Episcopal Church here in this country. Indeed, as a historical figure in this land and in The Episcopal Church, Absalom Jones is someone important for us to remember. One thing in particular I want to call to your attention today about this remarkable man. Absalom Jones had every reason to engage in self pity – but he did not. He easily could have claimed the role of victim – but his life had no place for that. Rather, Absalom Jones chose the path of liberation and affirmation, as he followed the way of Jesus Christ. For us today, it is important to recognize that we have choices to make in our lives – and that by those choices, we set the direction of our faith journey through life. I am referring here to the message that we probably heard countless times as teenagers – and those who are parents of teenagers have repeated the same message – that our choices have consequences. And, I need to add, as adults we still need to hear and to heed that same message. We have choices to make in this life. By means of those choices, we set the direction of our lives. Thus, our choices do have consequences. Now, having made that point here, it occurs to me that I could apply it in a variety of ways appropriate to our time and circumstances. That is, applications are numerous and wide-spread in our day, here in South Carolina. However, in this Address, I will mention only one example ... and I will leave you to contemplate others. I want to suggest a choice for your life which is biblically appropriate and spiritually enriching. It represents a choice that I am convinced will make all the difference in your life as a faithful follower of Jesus Christ. That is, I commend to you today a life of gratitude ... a life focused on giving thanks. To live such a life, we must make the choice to do so. It does not always come naturally. In fact, it seldom does. Like Absalom Jones, we sometimes could justify an attitude of self pity or the role of victim – no doubt. But we have a choice to make – and a consequence of our choice involves the health of our spiritual lives. I implore you today to choose to be grateful about life ... and to give thanks continually to God for that life. Such an attitude puts us in right relationship with God, for giving thanks acknowledges God as Creator, Savior, and Sanctifier – and as the ultimate source of all good gifts. Gratitude also puts us in right relationship with other human beings, who are our fellow travelers in this life, companions on our way, and brothers and sisters of Jesus, along with us. As we live in those right relationships with God and with our fellow human beings, therefore, we are enabled to accomplish the convention theme – “To love and serve the Lord.” Therefore, gratitude provides the basis for loving relationships, following the Great Commandment. And gratitude also offers the motivation for Christian mission, as we love and serve the Lord. Now, let me practice a bit of what I preach. I want to give thanks to a number of people who love and serve the Lord, in significant and important ways. Thanks, first of all, to those who have made ready for this Convention – the clergy, the staff, and the people of Grace Church; our brand new, part time, hard-working, highly competent diocesan staff; and the various other groups – official and unofficial – who have helped prepare for this convention of The Episcopal Church in South Carolina. These folks had precious little time to prepare for a convention ... and, yet, in six weeks time, they have hosted two of them! They certainly deserve our thanks. Thanks, also, to the people who have agreed to accept positions of leadership in The Episcopal Church in South Carolina. The fact is that few remaining Episcopalians had any previous experience in diocesan leadership, for obvious reasons. Nevertheless, your willingness and your commitment are as impressive as they are necessary. I am grateful to you for your service and for the exercise of your considerable gifts. Thanks, as well, to those Episcopalians who have journeyed out into the wilderness in recent times, seeking the Promised Land. You have had to leave your spiritual homes behind, trusting in God and one another, and facing an uncertain future. But you have persevered thus far, and God will provide a way forward in days to come. Thanks, in particular today, to St. Mark’s, Port Royal, for your past faithfulness in this regard and for the good example you offer to others traveling this way. Next, thanks to the several resource parishes with which we are blessed in The Episcopal Church in South Carolina. These larger communities of faith bear witness to the reality and the importance of our connections within The Episcopal Church. Already you have been generous in sharing resources with others, and that generosity will be even more important in days and months to come. Indeed, to a great extent, the degree to which we are healthy and flourish as a diocese in the future will depend on your continuing commitment to the whole of our diocese. Speaking of connections, thanks also to the greater Episcopal Church. This body of which we are blessed to be a part has offered us support and encouragement in many, many ways. Parishes and missions from other dioceses have sent money and supplies to our continuing churches and worshipping communities. Priests have traveled great distances to lead worship services here. The Executive Council of The Episcopal Church has granted us funds to assist us in this initial year of reorganizing. Workshops on surviving church traumas and on improving communications will be offered in two weeks time by members of The Episcopal Church staff. Be aware, also of other opportunities for engagement with the larger church, some of which have already been scheduled and are identified on fliers in your registration packets: for instance, opportunities to be involved with Province IV youth events and the invitation to attend a diocesan Acolyte Festival. Finally – in terms of reasons for gratitude for the greater Episcopal Church – we are organizing opportunities for clergy continuing education and for encouraging and supporting healthy congregations, with the help of the Church Pension Group. Thus, there are many, many things to be thankful for, in The Episcopal Church in South Carolina. May gratitude guide our hearts, direct our wills, and inform our prayers, in all the days to come. And may we be enabled, therefore, to love and serve the Lord. In summary, then, we have so very much to be thankful for – as individuals, as churches and worshipping communities, as The Episcopal Church in South Carolina, and as Episcopalians who are part of the Anglican Communion. But, being thankful requires a choice, as does a life of gratitude. I commend that choice to you, as a way of life. The choice of gratitude will enable faithfulness, as we follow the way of Jesus Christ and as we seek “to love and serve the Lord.” And, it will be a whole lot more fun as well! The Right Reverend Dr. J. Neil Alexander, Dean of the School of Theology at the University of the South and former Bishop of Atlanta, preached at the Choral Eucharist that opened the Convention on Friday, March 8. This is the text of the report given by Dolores Miller for the Committee. In his convention address to this body earlier today, the Right Reverend Charles vonRosenberg reminded us of the remarkable life of American hero Absalom Jones. 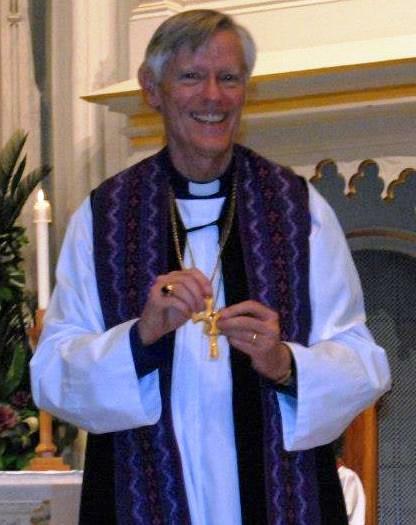 With grace and insight, the Bishop pointed out that Absalom Jones had little regard for self-pity, choosing ...choosing, instead, a higher path, one of “liberation and affirmation.” Not surprisingly, the Bishop found a parallel in present day history, in the choices facing Episcopalians in this region of South Carolina. And, what is this suggestion? CHOOSE to be grateful about Life! A LIFE focused on giving thanks. A Life of Gratitude spent in right relationships with God and our fellow human beings. In concluding his address to this convention, Bishop vonRosenberg expressed his gratitude to a multitude of multitalented men and women, some of them here gathered, and all of them well deserving of his thanks and praise. You have spoken, Bishop vonRosenberg. And, we have listened. More importantly, we have heard. And, we embrace your wisdom. You make an impressive and convincing argument for ALL of us to shake off any remaining shreds of self pity and begin expressing our gratitude intentionally, vigorously, and sincerely. I am so excited to be here with you, in the hope and faith and courage and love and joy that is The Episcopal Church in South Carolina. alone. We come representing the encouragement, prayers and support from the Diocese of Virginia for what you are doing here and all the ways you are living your faith. And for whatever else you may need, we are only an e-mail or a phone call away. Jennifer and I come from Virginia congregations that have continued worshipping God as Episcopalians outside our buildings for over five years. We are visitors from Virginia, but we are also something more. Since the pain and adversity you are dealing with now happened to us in Virginia six years ago, there is also a sense in which we are visitors from the future. I want to ask each of you to remember this moment. Remember it because at future conventions next year, and three years from now, and five years from now, and ten years from now, you will be looking back on this convention with deep gratitude for what you have been doing this year. And as you look back at this convention from those future conventions, you will reflect on how the things which felt so daunting at this convention have become realities. At future conventions you will reflect on how things you were afraid of at this convention have become things you are at peace with. At future conventions you will reflect on how the hope and freedom and joy and faith you had at this convention have just kept continuing to grow. You will see different things happening more and more now. Once you have made the decision that you refuse to be intimidated, then you notice more and more that the arrows that are aimed at you and meant to harm you just bounce right off your shoulders, leaving you intact. Once you have seen that when you have God and each other, you have everything you need, then the blessings just keep appearing: physical things, events, and especially God providing exactly the right person at exactly the right time. Once you know that church doesn’t have to be consuming what somebody else puts on your plate, you have the freedom to be creative in creating your own feast, and pulling all your favorite ingredients from a full pantry to create a delicious Church, the Church you have always dreamed of, where you feast on the love of God with your friends and your loved ones and your neighbors and even strangers, all gathered at the delicious feast. I am so glad to be with you to enjoy the party! 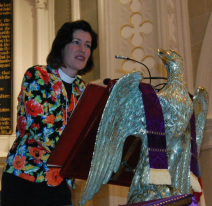 CHARLESTON – With a focus on gratitude and service, about 250 Episcopalians from across the eastern part of the state gathered here Friday and Saturday for the Annual Diocesan Convention of The Episcopal Church in South Carolina. A spirit of joy and celebration opened Saturday’s business session, as about 30 members of St. Mark’s Port Royal, a worship community near Beaufort, gathered outside the front doors of Grace Episcopal Church on Wentworth Street, where the Convention was taking place. Dressed in red and carrying crosses, banners, and flags bearing the symbolic lion of St. Mark, the group waited for the official vote that granted them “mission” status, with seat and vote at the Convention. Approval came by acclamation as the Convention crowd stood and applauded for the group from St. Mark’s. At the announcement, they marched in behind a processional cross and an Episcopal Church flag, singing a hymn and circling the nave with handshakes, hugs and a few tears. The theme of gratitude continued in the Bishop’s address as he gave thanks to the faithful within the diocese for their service and perseverance, and to those in The Episcopal Church beyond our borders who have given their support. Workshops, training sessions, youth events, continuing education for clergy, and other opportunities are being made available, and the diocese has much to be thankful for, Bishop vonRosenberg said. 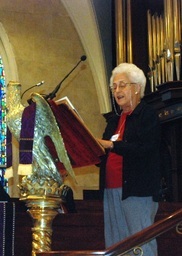 The Convention is the annual gathering of the diocese in eastern South Carolina that is continuing as a part of The Episcopal Church. Because of a lawsuit filed by a group that has left the Church, the diocese is using a working name, “The Episcopal Church in South Carolina,” at this time. On Saturday, delegates took steps to adopt amendments to make the Constitution and Canons of The Episcopal Church in South Carolina to be consistent with the 2007 version and to conform with the Constitution and Canons of The Episcopal Church. Changes to the canons received the required approval by a two-thirds vote in both the lay and the clergy orders of delegates, and their adoption is final. The amendments to the constitution were approved on first reading, and must be given final approval at the next annual convention in order to take effect. Delegates were presented with a balanced budget for the Diocese of $378,000 for the year ending in March 2014. Income for 2013 includes $203,000 contributed by parishes, missions, worship groups and others, and $175,000 from a grant approved last month by the Executive Council of The Episcopal Church. The Treasurer of the Diocese, the Reverend Jim Taylor, said this is a one-time grant; assistance from TEC in any future budgets would come in the form of a loan. If such a loan is needed in 2014, Fr. Taylor said, the diocese hopes it would be only a small one. “We hope we can meet our goal of becoming self-sufficient,” he said. Ten parishes and 11 missions were represented at the Convention, including the newest, St. Mark’s, Port Royal. Also represented were eight “continuing parishes and missions,” groups of people who are remaining with The Episcopal Church at places where the leaders of their parish or mission have said they are leaving TEC. Six worshiping communities also attended. These are groups that have formed to provide opportunities for worship and fellowship for people displaced from their churches. They are St. Anne’s (formerly the Conway Worship Group), Edisto Worship Group, Episcopalians of the Florence Deanery, the Continuing Episcopal Church in Summerville, East Cooper Episcopalians, and West Ashley Episcopalians. For now, these groups could not vote at this Convention, but some are on their way toward mission status and hope to be recognized at the 2014 Convention. Trustees of the Diocese were elected. Lay members are Jan Gilbert, Grace, Charleston; Betsey Walker, St. Stephen’s, Charleston; Robert Moffitt, St. Thomas, North Charleston; Robert Pinkerton, St. Mark’s, Port Royal; and Dr. Charles Carpenter, Episcopalians of the Florence Deanery. Clergy members are the Reverend Jim Taylor, the Reverend Jack Nietert and the Reverend Bruce Evenson. Members of the Ecclesiastical Court also were elected. Lay members are T. David Hoyle, St. Stephen’s, Charleston; and Carrington S. Wingard, Episcopalians of the Florence Deanery. Clergy members are the Reverend George Tompkins, the Reverend Jean McGraw and the Reverend David Williams. - Heard reports from York Place Episcopal Home for Children, Voorhees College, two groups that have been associated with The Episcopal Church throughout their history. - Heard from Episcopal Relief and Development’s diocesan coordinator, Harmon Person. ERD is the worldwide humanitarian agency of The Episcopal Church. Support for ERD is getting more focused attention in the reorganized diocese. - Approved a resolution that the offering from Friday’s Choral Eucharist be used to establish a Discretionary Fund for the Bishop. - Received a gift of $3,000 donated by The Episcopal Forum of South Carolina to help pay for work to convert classroom space into new offices for the Bishop and his staff at Grace Church, Charleston. - Announced that the next Annual Diocesan Convention will be held February 21-22, 2014 at All Saints, Hilton Head Island. Bishop, St. Cuthbert is one of the great saints of our Anglican family. He lived in the 7th century and served the region of Northumbria in northern England. For most of his years he lived the life of a monk, leading communities in the hinterland. In time, he would retire to the coast. Interestingly, Cuthbert would be called out of retirement to become bishop. Regarding his predecessor, let’s just say that there had been a little controversy before Cuthbert took the crozier! What’s more important to say is this: Cuthbert’s main ministry would be pastoral in nature. He would become an agent of healing among his people. Oh yes, and by the way, he lived on an island! Bishop vonRosenberg, on behalf of the Standing Committee and on behalf of our entire diocesan family. Please accept our gift of this St. Cuthbert Pectoral Cross. We thank God daily for you and your ministry as Bishop among us. 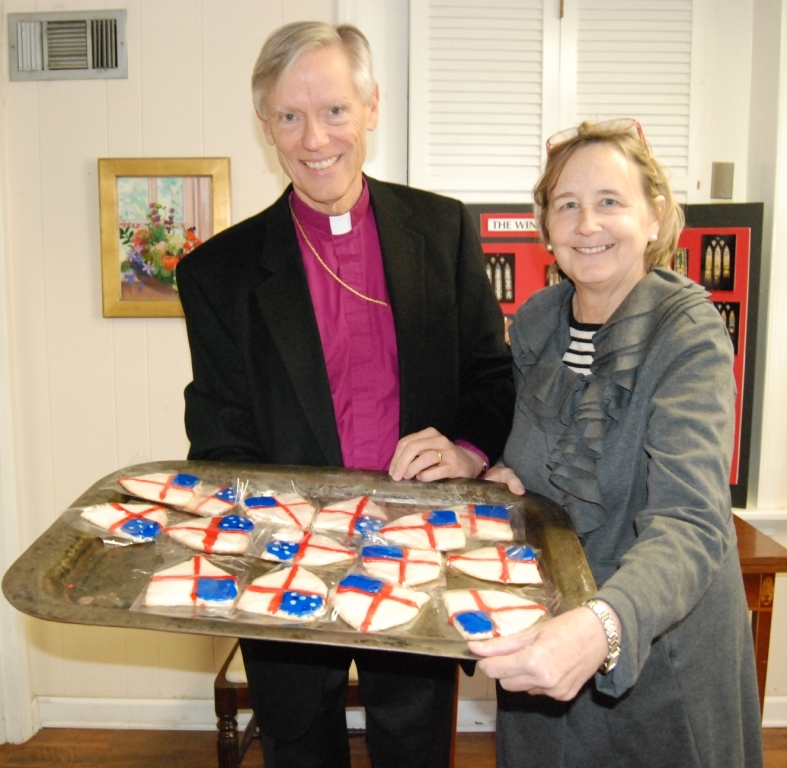 March 7: Bishop vonRosenberg and his wife Annie deliver a batch of homemade Episcopal Shield cookies to the staff at Grace Church, where the Annual Diocesan Convention is being held.